Friction stays are for use on side hung and top hung casement windows allowing ease of opening and closing. If your window suffers from weak friction and has lost its grip, well a friction stay is what you need! They feature packers and self-tapping repair screws and have been tested to over 30,000 cycles, so it'll never get tired of you constantly opening and closing windows! 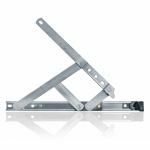 Manufactured from high quality ferritic steel material making it resistant to weather and vandalism, you can apply these friction stays to all types of windows. You can even add multipoint window locks and window restrictors to increase the security for your windows, preventing intruders from breaking in. From popular manufacturers such as VERSA, these friction stays are fantastic products to use on your window and are affordable for all budgets!